It prints on both sides of textile tapes, cardboard labels, pressed tubes continuous or ready-for-use, as well as on endless materials made of plastic, paper or cardboard. The ribbon separates from the materials with the help of a draw roller that also improves the accuracy of the imprint. No print head adjustment necessary with different material widths. Print rollers provided for slim and thin materials. For single-sided printing with centered material positioning and drawing roller please go to label printer SQUIX 4 MT. Paper labels, self-adhesive labels, cardboard, textile and plastic materials as well as shrink tubes can be cut. In addition, the materials can be perforated before they are manually separated. The printed materials are cut and stacked. If the maximum stack height is reached, printing is interrupted. Even stiff or curved materials can be processed. We recommend to have these applications tested at our premise. High print image with cab ribbons. The right material for every application. 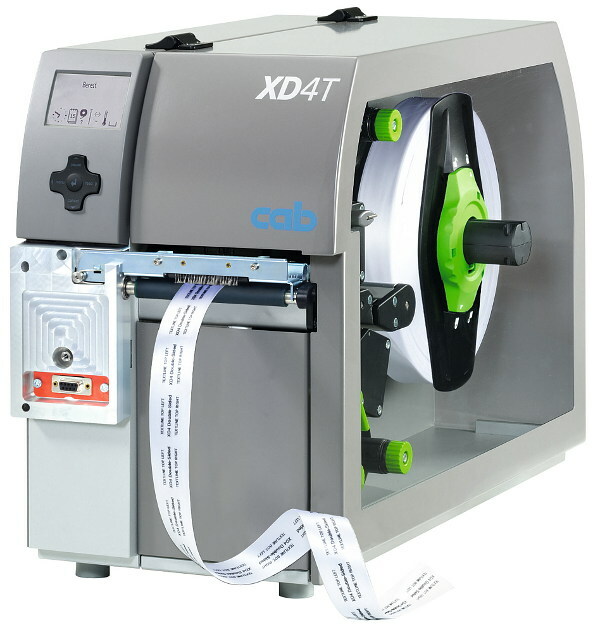 The software, which was developed by cab, opens the full potential of cab devices during label design. The three-part tightening axles enable the ribbon to be easily inserted. A preprinted ruler simplifies the adjustment. The print head is pressed on by two plungers. As the materials are centre-guided in the device, no print head setting or adjustment is necessary. The material guide just in front of the print roller provides ac curate imprint. The material width is adjusted with a spindle. Additional modules are quick and easy to connect. All peripheral devices are plugged to the printer with the help of two pins and are fixed with a screw. primarily if continuous or textile materials as well as shrink t ubes are processed. At high heat energy the ribbon can stick with the textile tape. A roller reliably separates the material from the ribbon. picking up core diameters of at least 38 mm (76 mm adapters for a better label winding are included in the delivery). The material roll automatically centers when setting the margin stop. In case of core diameter 100 mm, an adapter is recommended. In order to achieve an accurate imprint with slim materials and ribbons, also slim print rollers are needed. These prevent from print roller wear, print head contamination and errors during material feed. Limitations may apply to small labels, thin materials or strong adhesives. Critical applications need to be tested. The ribbon should at least correspond with the width of the liner mat erial. If the operation panel is no longer accessible after the printer has been installed in a plant, an external one can be additionally added. A slot to connect a CF memory card Type I as well as a host interface are provided. Up to 16 labels per box can be selected from the memory card by a master control, e.g. PLC. Two boxes can be connected. The I/O box allows simple PLC control processes with four inputs and outputs each via abc programming. Only few cards left in stock. After the remainder has been sold out, no repeat orders are possible. The printed materials are cut and stacked. If the maximum stack height is reached, printing is interrupted. Limitations may apply to stiff or curved materials. We recommend to have these materials tested at our premise. with built-in power supply units. To be used also with external printers. Label winding outside or inside. In the stand-alone mode with additional network connection, the Database Connector enables printers to access data directly from a central ODBC-, OLEDB compatible database and to print it as a label. 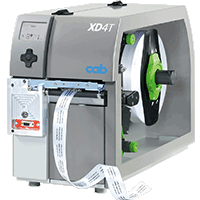 The cab Network Manager enables the user to control a number of printers across a network simultaneously. It supports monitoring, configuration, firmware updates, memory card administration, file synchronization and PIN administration centrally. A general programmer's guide explaining and describing commands for different printer models via direct programming. How do I change a print head at A4+?